In a networked economy, a great deal of attention is devoted to the availability of server and application resources. There must be availability of servers, applications and network connections. The latter of these is often overlooked, and businesses can lose substantial revenue because of network outages. Here we take a look at different ways of ensuring mission-critical reliability without having to pay a fortune for it. Having a network connection is essential in contemporary business. Pretty much all of the business of a modern enterprise will depend on it. This is the result of networked services, with business applications and business partners increasingly being available via a network. During the last few years there have been increasingly centralised services, with all applications residing in the company�s server room or in the facilities of a service provider. Clients often own no business applications at all. The model of the Application Service Provider (ASP) is used instead � the service provider has centralised equipment and applications, and the client then rents the right to use them. The owners of centralised facilities go to great lengths to ensure the availability of services � the servers are kept in separate rooms with full protection against fire, flooding, physical damage or inappropriate environmental conditions in terms of temperature and humidity. Uninterrupted power sources and diesel generators are provided so as to ensure that there is no breakdown in the power supply. The selection of a decent outsourced central facilities provider, in short, will ensure that there are no availability problems in that regard. Given all of this, problems with network connections must be found somewhere else. A highly available central system is not in and of itself enough. It must be accessible from the customer�s location. The network connections which customers have in their offices must satisfy the requirements of business application availability. It is often the case that the levels of service that are offered by network service providers are far below those that are required by central systems. This availability of applications can be seen as a chain running from the central system (server) through the backbone network, then through the last mile to the customer�s LAN and, finally, PC (Figure 1). Different parties will address the various issues that are related to this chain. The central system will be under the control of the outsourced service provider or the customer�s own IT department. Local LANs and PCs are under the control of the customer. A LAN can be designed to be redundant, or there can be a spare switch or router somewhere that is available if there is a failure. This applies to the PC, as well, as well as to the applications that can be accessed from a colleague�s PC when necessary. All of the links in the availability chain are covered to a certain extent by IT departments, and there are many IT companies which can offer central support or support at the level of LANs and PCs. This is a well defined area, and there is focus on this either from the perspective of the client or that of the service provider. Backbone networks which provide intercity transmission are well designed and redundant. The area on which there is the least focus is the so-called last mile � the connection between the service provider�s node and the customer�s facilities. This usually involves copper or fibre optic cables that are installed in cable trenches. Service Level Agreements (SLA) define availability and maximum downtime, but these are often less than clear, and they can provide for much lower levels of standards than is the case with central systems. With a poorly defined SLA, customers can find that the promise to fix problems with a network connection applies only to the next business day, or that availability is only guaranteed for 97% per month. That is a far worse situation than is guaranteed by central systems. There are two solutions here. One is to demand a higher SLA level from network service providers. This can mean higher (sometimes substantially higher) monthly costs. In that case the network service provider guarantees faster response times and higher availability of network connections � 98.55%, for instance. There can be even higher availability figures (as much as 99.5%) and shorter response times (within two hours). The price of such higher-level SLAs tends to rise very steeply, and there are some service providers which do not offer such options at all. The other solution is more affordable and may ensure a very high level of service availability. This is possible when there is a second network service provider in the environs of the customer. Then the customer can order backup connections from the other provider, the result being two network connections for the customer�s offices. The service provider can also install a load balancing router which both connections can use simultaneously. This increases the available bandwidth, too. 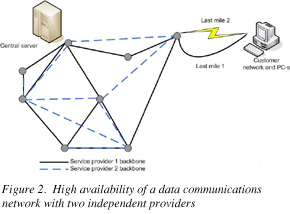 As long as these connections do not share the same backbone and last mile infrastructure, the resulting SLA will be at a far, far higher level than any individual provider can ensure. What�s more important is that this will not involve massive prices. The price will double in most cases, although it can be lower if the backup connection is slower than the primary one. This situation can be seen in Figure 2. Availability increases substantially. The regular SLA guarantees 98% availability (that means 14 hours of allowed downtime per month), but the two independent connections guarantee 99.96% availability, which means just 20 minutes of downtime per month. These are huge gains in comparison to the increase in the price of the services. Of course, this level of high availability may be a bit theoretical. If there is a massive power outage, for instance, then both connections will eventually fail as UPS equipment runs dry. It is likely in such cases, of course, that the customer will shut down operations altogether because of the lack of electricity. Nevertheless, in all other cases the level of network availability will be much higher. What we are discussing here is the last mile to the customer�s office and the redundancy of the transport network. The same network connection availability issues also apply to the location of the central server, but the solution that is described here can be used for that purpose, as well. The thing which the customer must understand very clearly is that the second provider must be totally independent. It must not use the primary provider�s transport network, concentrators in cities for the last mile, or the last mile itself. The cable trenches should be independent, too, because even if the alternative operator has its own cables, they are often laid in the same trenches, because all trenches are owned by the incumbent (formerly state-owned) operator. In most cases, that operator will be the customer�s primary operator. The most suitable method for last mile redundancy is the use of radio links � WiMAX point-to-point connections. These can provide the usual access speeds of 1-4 Mbit/s, or even as much as 30-80 Mbit/s. The beautiful thing about the radio solution is that it utilises totally different physical locations which have nothing to do with copper or fibre optic cables that are laid into trenches. Cables can be accidentally cut, but you can�t do the same to a radio link. Of course, someone may put up a structure between the base station and the customer�s site, but this will mean just a slow degradation in the link speed, because no one can put up a building overnight, and such construction work will become readily evident in a timely way. The service provider can then simply relocate the access equipment or direct the customer to use a different base station. What is less visible here is the transport network. 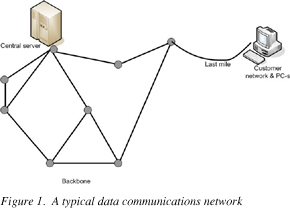 A customer can ask that the provider reveal or explain which links are used for intercity data transport. There are alternatives to the incumbent networks in all three Baltic States. To summarise, when taking decisions on these matters, it is important to make sure that the backup network is independent at the level of transport and last mile access from the primary provider and that the service levels that are required in today�s networked economy are achieved.